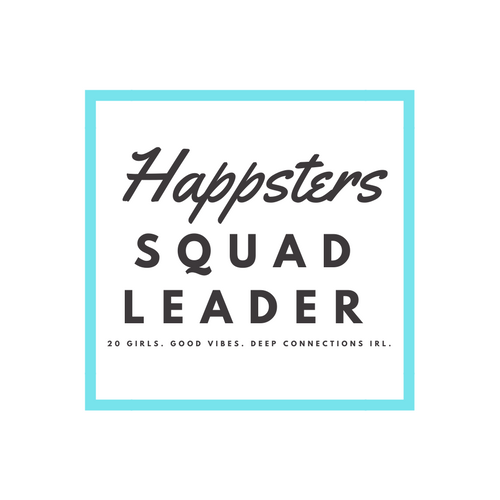 We’re so excited to welcome our newest Happsters Squad Leader, Janelle to the community! She is the Leader for the first Happsters Squad in Sacramento. 3 things that make me happy are being around my family and friends, being outside in the sunshine and flat whites with non fat milk. I just love my flat whites and the little boost it gives me to start my day. My favorite book right now that I reread and highlight is the The 7 Habits of Highly Effective People. I love self development books and the principles have really resonated with me. I also love listening to Lewis Howes’ School of Greatness podcast. He always has inspiring and uplifting messages. I like to listen to podcasts while I’m getting ready in the morning, its a really great way to start the day. My dream job is to have a thriving health coaching business and lifestyle blog. I’m passionate about helping others blossom and reach their fullest potential. I’m currently working on creating a side business for my coaching and I do have a blog called thegratitudediva that I launched last summer. My blog is a lifestyle blog where I share health and wellness tips, girl boss tips, and much more! I currently help manage an alternative medicine practice and I love working for a doctor where we both share a passion for helping people. When I’m lounging on my day off I like to watch any health related documentary or cooking shows! I also watch old movies and comedies on Netflix. Breakfast at Tiffanys and Bridesmaids are a couple of my favorites. 5. What are your favorite things to do in Sacramento? There are so many fun things to do here in Sacramento. I love food so I always go the newest restaurants and look for all the healthy meals, but I’m always a sucker for some in-n-out burger. Sacramento and the surrounding area is full of beautiful hiking trails and the American River bike trail is a great place to run on horse trails, bike or kayak. I feel like you can have great adventures here! 6. What is your favorite affirmation/quote? “If you hang out with me for too long I’ll brainwash you into believing in yourself and knowing you can achieve anything.” I believe words of encouragement and support can go along way. 7. Where do you find you are most at peace? I find my peace when I’m baking. I call it my zen time ,not a worry in the world when I’m in the kitchen, whisking away and listening to some good beats! John Legend, Frank Sinatra, Luke Bryan and Snoop Dogg are on the baking and beats place list 🙂 I also find peace at barre class or yoga I like to let it all go on my mat.